Spring is in the air and Los Angeles is buzzing with fun things to do. To help you get to the good stuff, we’ve picked this week’s best bets. Erin Sullivan stars in this one-woman show about the loves, losses, and legend of Marilyn Monroe. Sullivan has been working on her Monroe for a while; before this production she was played the icon in the original cast of Marilee and Baby Lamb, by Tony- and Pulitzer-winning playwright Mark Medoff. Six female comedians and storytellers share the stage at the Virgil in East Hollywood for a night of opening up about the trials, travails, and hilarity of attempting to find love and companionship in the Tinder age. Between them, they’ve put up with hundreds of internet dates, so there’s plenty of material. Think you can top their crazy stories? There will be a chance for one audience member to reveal a wild encounter of their own. Tickets for this fundraising night benefit 826, the youth literacy program launched by author Dave Eggers. Students from the program will share remarkable stories from their own lives in Los Angeles, along with special guests Jimmy Kimmel, Danny Trejo, Reggie Watts, and city poet laureate Robin Coste Lewis. The gala includes dinner and a musical performance by Benjamin Booker. If you can’t wait for the upcoming Netflix pop-up experience–or you just really want to go deep into the world of British royals drama The Crown–stop by this free, public exhibit up at the Paley Center for Media. You’ll see several stunning wardrobe pieces from the production and learn about how designer Jane Petrie developed the show’s historically inspired style. Snag your tickets in advance (they have a reputation for selling out) and be a part of the tenth season of this charming summer Friday tradition. Silverlake Wine brings selections for tastings, food trucks post up with a variety of options, and KCRW DJs provide the tunes. 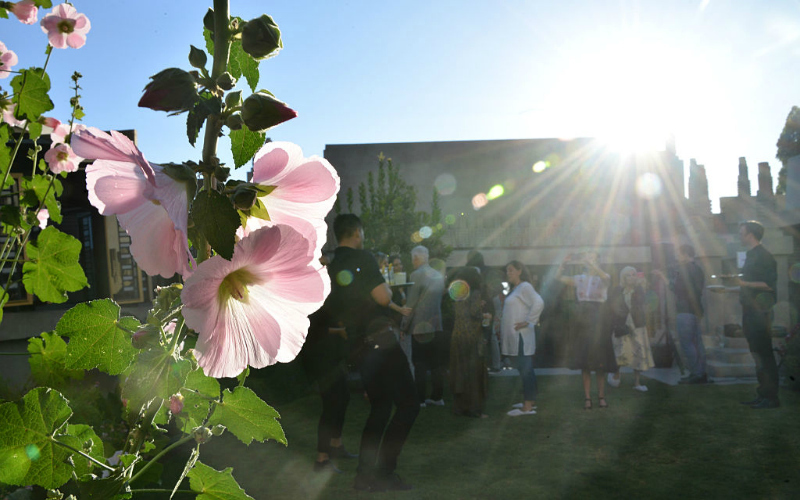 In addition to soaking in the views and tastes, attendees have the option of upgrading their tickets to include a special tour of the interior of the Frank Lloyd Wright-designed Hollyhock House.